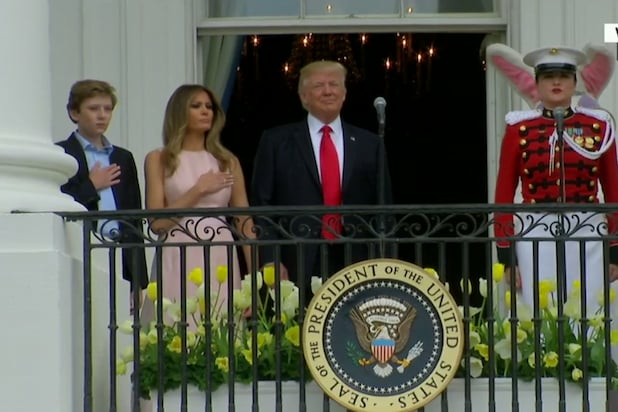 First Lady Melania Trump appeared to give her husband, President Trump, a subtle nudge to remind him to place a hand over his heart for the National Anthem during Monday’s annual White House Easter Egg Roll. One user tweeted, “If you see a longer version of the video. You realize that Trump had to check where his heart was.” Many pointed to the fact that the First Lady is an immigrant. “Quite telling that the first lady, an immigrant, had to remind him,” Huffington Post writer Andy McDonald wrote. President Rutherford B. Hayes started the Egg Roll tradition back in 1878, with the bunny first making an appearance in 1969 during President Richard Nixon’s administration, according to the New York Daily News. Other than the National Anthem moment, the 2017 version of the Egg Roll appeared to go off without a hitch. Unfortunately for Trump, it doesn’t take much to get mocked across social media these days. "I want to start three wars." "Sir, perhaps you should master the National Anthem, and then we'll move on to bigger things." Trump doesn't go to church, doesn't hand-over-heart during the national anthem & wastes taxpayer money every single weekend. @JordanUhl Look at his face…he couldn't hear the National Anthem over the song in his head – "Donny Trumpy is the best, doo da, doo da…" Sickening. Just saw a video where Melania Trump had to nudge Donald Trump's hand so he could put it over his heart while the national anthem was on. ???? I was taught that during #NationalAnthem that you are supposed to put hand over heart. Am I wrong? Since taking office on Jan. 20, President Trump has boosted ratings for all the major cable news channels. But none more than MSNBC, which grew a whopping 55 percent in the first quarter of 2017 compared to the same period in 2016. In fact, the network has the 16 cable news shows that have shown the most growth. Greta Van Susteren ditched Fox News for MSNBC and her new show has grown 23 percent compared to the week of Trump’s inauguration, while CNN has remained stagnant over the same time period. The midday newscast that airs from 2-3 p.m. ET has grown 28 percent compared to the week of Trump’s inauguration, while rival networks have lost viewers over the same timelot. Ruhle’s daily newscast airs directly after “Morning Joe” at 9 am E.T. and has gained 30 percent of total viewers compared to the week of Trump’s inauguration. Williams’ nightly program has grown 30 percent since the week of Trump’s inauguration while CNN’s 11 p.m. ET program has gained 10 percent over the same period. Rachel Maddow’s lead-in has delivered, growing 32 percent compared to the week of Trump’s inauguration, while setting the table for one of television’s hottest programs. Hayes has the only cable news program among the big three networks to see an increase over the timeslot. Melvin’s daily newscast that airs from 1-2 p.m. ET has increased 33 percent compared to the week of Trump’s inauguration, with Sean Spicer’s White House press briefings being a hot topic this time of day. “Hardball” paves the way for MSNBC’s red-hot primetime lineup and has seen an increase of 33 percent himself while rivals have lost viewers over the same span. Snow’s version of “MSNBC Live” airs from 3-4 p.m. ET and has increased viewership 34 percent compared to the week of Trump’s inauguration, while both CNN and Fox News have dropped. O’Donnell has one of the best timeslot in cable news… directly after Maddow. His audience has grown 35 percent since the week of her record-setting Trump reveal episode compared to the week of Trump’s inauguration. Joe Scarborough, Mika Brzezinski and Willie Geist’s “Morning Joe” trends on social media essentially every morning, as it appears to be the go-to morning program for political Twitter. “Morning Joe” has picked up a 35 percent bump in viewers compared to the week of Trump’s inauguration. 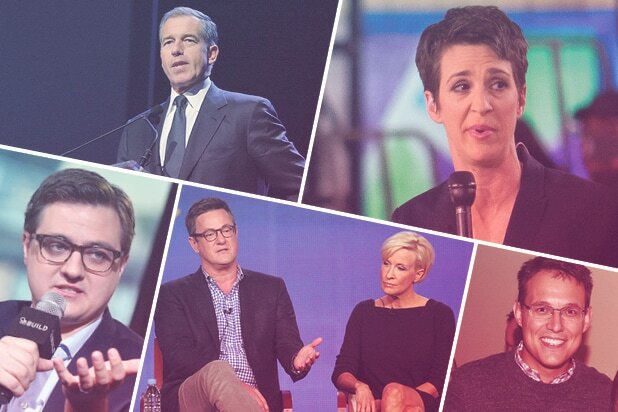 Chuck Todd’s daily version of NBC News’ “Meet the Press” airs at 5 p.m. ET and has grown 37 percent among total viewers over the past three weeks compared to the week of Trump’s inauguration. Mitchell’s daily program airs at noon ET and has grown 38 percent compared to the week of Trump’s inauguration. Jackson’s version of “MSNBC Live” airs at 10 a.m. ET and has grown 39 percent in total viewers compared to the week Trump was sworn in, while rival CNN has grown 16 percent over the same time period. Kornacki’s daily newscast has seen a 42 percent increase among total viewers compared to the week of Trump’s inauguration. Many version of “MSNBC Live” have a permanent host for a specific hour of the day, but the 11 a.m. edition features a rotating group of the network’s talent and has seen a whopping 43 percent increase among total viewers since the week of Trump’s inauguration. Was there really any question which show would occupy the top spot? Maddow’s viewership has increased 44 percent compared to the week of Trump’s inauguration. Maddow was already on fire when she revealed Trump’s 2005 tax return and viewers have continued to flock to her program on a nightly basis ever since.